Tate’s been on metronomics for about a month now. Seems he had a little trouble the first few days, barfed a couple of times. Someone peed in the house and I think it was him, not Sam. But since then no problems whatsoever…well, an ear infection but I think that’s just too much lake water in his ears. He’s on 12 mg of cytoxan and 100 mg of Rimadyl every day, plus fish oil. His white blood cell count is back up to normal, all his blood work is normal, everything looks normal. This is a normal we can live with, hopefully for a long, long time! We’ve just been taking advantage of summer to enjoy him and love him. Another long cabin trip earlier this month, visits to the beach, visits to Grandma’s (there’s a pond there…hmmm, can you tell Tate loves water?) We are so thankful for this time. His birthday is next week and I remember when we were so worried he’d never see his 5th birthday – see how useless that worry was? Just a note about Tate’s birthday. I posted this earlier but it’s pretty cool so I’ll post it again. My sister, who passed away about a year after we got Tate, was a huge, huge animal lover. She had a real menagerie of pets. She was SO happy when we got Tate – she just wants everyone to be happy, and being happy means having a pet to love. So she was REALLY happy when my brother got his first dog, too. She’s a cute little boxer named Toots. And the cool part is that Diane’s birthday was August 16th, Tate’s birthday is August 16th, and Toots’ birthday is also August 16th. The stars are all aligned, everyone is right where they should be, we’re all part of the cosmic plan. Life is good. That is a very sweet story. It’s nice when the stars are all aligned! great picture on the boat!! glad tate is doing well with this protocol – paws crossed for continued success!! Very happy to hear the great update on Tate! Glad to hear that Tate is doing better. That is so cool about Tate’s birthday, Toot’s birthday, and your sister’s birthday! 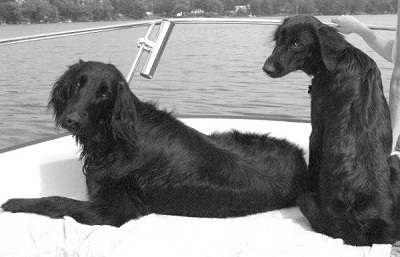 And Tate, you look good on a boat (so does Sam). Here’s to Metronomics and the 16th! The Tripawds nation is getting ready to rock and roll next week! Tate, thanks so much for sharing the story We are SO very happy you are doing well. If your energy at the beach is any indication, you will indeed be around for a long, long time. Aw they are gorgeous and look like they’re having so much fun! What breed are they? Well, thank you! They are flat-coated retrievers, Tate (left) is our Tripawd and Sam is his little sister, 6 months old in this picture.